In Hyena Supbpoena, written and produced by Cat Kidd, and playing at the Toronto Fringe Festival, the writer/performer stalks about the stage like a predator sizing up her captive audience. She opens by telling us that, were she able to be a hybrid, she would choose to be part hyena. In other languages, the word for hyena also means to vacillate or be in flux, changeable or metamorphic. This state is celebrated in Kidd’s wending, mesmeric piece; derided for their strange laughs, ugly visages and unusual anatomy, we find hyenas are actually practical, efficient, and above all, intense. It is that near-feral intensity that defines Kidd’s performance; essentially a series of thematically-connected spoken-word poems, Hyena Subpoena fairly bristles with the joy of intricate language and the ability to find one’s way in the world. 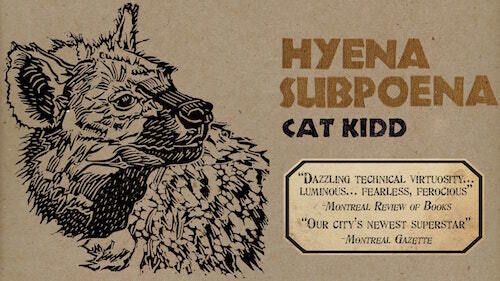 I’ll admit that this show might not be everyone’s big game, but I’m incredibly pleased to have bagged Hyena Subpoena to review. It’s unique, powerful, and deserves a bigger audience to match its star’s presence. Sending us through a series of animal-related life experiences, the show connects each creature to a life lesson or discovery. A diffident psychiatrist becomes an elephant, an eccentric art teacher a bird, refugees are prey and the hyena mimics Kidd’s own experiences as a rule-breaking scavenger of discarded food. Like the elephant figurine a young woman clings to in one story, all the animals have a specific and targeted symbolic value. This poetry chapbook come to life is anything but a dry reading or a static session. Kidd is really fantastic at embodying both the animals and humans in her stories, giving them distinctive voices and personalities. My favourites were a pair of antelope/impalas, signified by a bargain-basement twist on a Lion King headpiece, who talk about the danger of separating yourself from the mass and their lack of luxury of having the time to mourn the dead. She’s also supported by effective projections that show us the animals and the titles of each section, which appear around the stage in inventive ways, such as on a tent, hanging laundry, or the side of a cooler. (One of these projections is a long, sustained shot of an animal dying from consumption; it makes a solid point about the indiscriminate nature of disease, but caution to the extremely sensitive.) Her accompaniment for each poem is a well-mixed backing track or beat, though this unfortunately means she has to be miked to speak over said beats. It’s all audible, but adds just a slight amount of remove between actor and audience. The only reason I even noticed this remove is that this is a show you really have to commit to watching; like Shakespeare, the rhythmic, constant flow of language all makes perfect sense when performed well, but it requires active listening so it doesn’t just wash over you. I was leaning forward in my seat the whole time to catch and consider everything. It was worth it. It seems a bit greedy to want more out of a commanding performance, but the one thing I wish Hyena Subpoena could give is a more cohesive ending. This is often an issue with a piece comprised of a series of smaller moments that relies mostly on a particular theme or style. The whole thing seemed set up to build and take us back to the hyena motif, but instead it just stopped. There were an extra five minutes in the time slot that could have been used to give us that satisfying bookend. For the 55 minutes it did use, it embodied all the powerful qualities of the hyena Kidd so admires. If, as in the jungle, Fringe is about survival of the fittest, I hope this has a long and healthy run.